Yesterday was likely my last visit to Wrigley Field for a CUBS game. A Cubs game at Wrigley is truly heaven on earth for me. 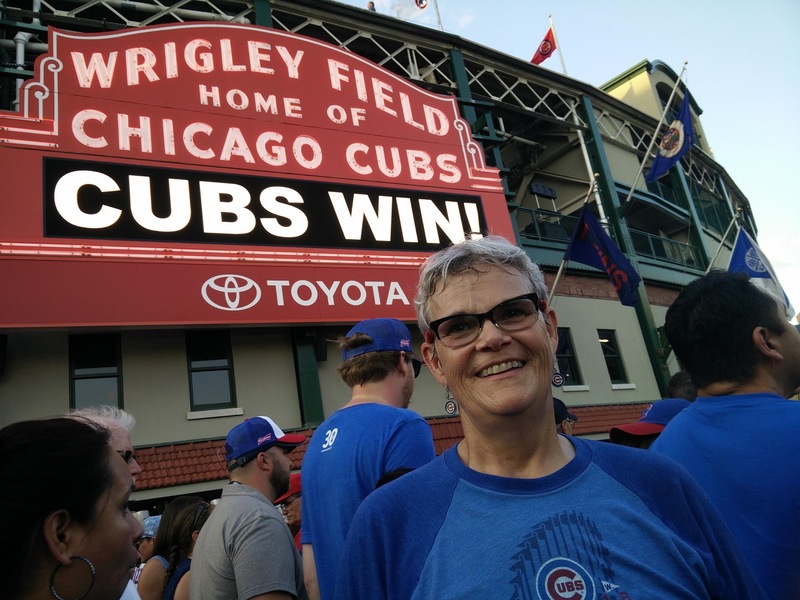 I love baseball, the Cubs, Wrigley, Wrigleyville--I know writing this will bring me to tears, this experience has such a huge place in my heart. I say my "last visit" because my friend who lives in Chicago and spoils me wonderfully with so much tourist fun is moving away, and I probably won't make the effort on my own to get to a game. I'm not "shutting the door," but it was important for my experience yesterday to recognize that it may be the last time I am there. While my friend went elsewhere to take care of some moving business, I stepped off the train at Addison and headed toward Wrigley. I did some requisite browsing in the souvenir shops. I know that it is not possible for me to be surrounded by too much Cubs paraphernalia. I discovered a mighty-fine Cubs golf bag, and posted a hinting suggestion with photo on Facebook. I've been consciously trying to open up more and talk with folks I don't know. 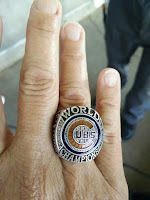 So I did that in the Cubs store, striking up a conversation with a woman working there. It was lovely. It turns out that she also is a tax preparer (what are the chances?!?!?! 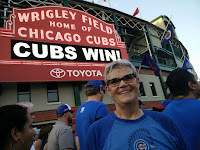 ), then she works in the Cubs store during baseball season. So like me, she is wildly excited on Opening Day, because it means the end of tax season is oh-so-close. She talked of how she loves working in the store because shoppers are so enthusiastic and excited to be attending a game at Wrigley Field. Pre-game ritual involves at least one beer at the Cubbie Bear bar directly opposite the Wrigley marquee. Temps were in the high-90s, demanding cool refreshment, so that was the next stop. While there, I also achieved one of my Chicago-weekend food goals--the real thing--a Chicago Dog. My friend joined me and around 3:00, and we headed across the street for the 4:05 game vs the Minnesota Twins. I used the pre-game time inside the stadium to roam, take photos, and just soak up the place and feel how much I love it and love being there. As I was roaming, I noticed a couple guys talking with an usher about his 2016 World Series ring. Since the Cubs had not won a World Series since 1908, the Cubs organization gave out 1,908 rings following the 2016 championship, so the usher said "everyone got one." How cool is that!!! There are three levels of "fanciness" to the rings, from the players diamond-and-jewel-encrusted ones to very plain. The one in the photo below is the mid-level one, on MY hand!!! Mercifully our seats were in the shade, down the left-field side just past third base. It was gross hot and muggy. I kept telling myself that all this sweating was worth it. I told my friend that my ultimate goal of the day was to be singing "Go, Cubs, Go" at the top of my lungs, because that means the Cubs won the game. It was my idea of a perfect game. The Cubs were down 5-2 and came back to win 10-6. The Cubs hit four home runs, including a grand slam by Addison Russell. There were errors overcome and great defensive plays made. And I got to sing, the perfect ending to a great Wrigley experience I shall hold in my heart always. I had a discussion yesterday with someone slightly older than my 62 years who is very near and dear to my heart. Both of us are noticing some physical symptoms of aging, experiencing folks near to us either very ill or passing, considering the prospect of our own passing, and thus, pondering what sort of life and legacy we'll be leaving behind. While these are natural thoughts relative to a limited earthly life, we don't want to dwell on them to the point of immobilized obsession. And we don't. I believe it is completely natural to wonder about what happens when we transition, and what it will be like for those we leave among the living. But then we go on about our daily business. Two beliefs relative to all this are very comforting to me. The first belief is that "we never get it done." We come into physical form to create. The very essence of our beings is to create. And no matter how much we do create, there is always a desire for more. This is not greediness. It is our spiritual nature demanding expression throughout our lifetimes, no matter how long they may be. On a comical note, this means to me that it doesn't matter if I die with my house not being clean, which will very likely be the case! The second belief is that "one cannot un-know anything." Once we know or experience something, we can't wipe it away. The joy in this to me is that our consciousness retains all we have learned and experienced even after we leave physical form, and all that wisdom is there for us, should we choose to take on another physical form. I think that's how human consciousness continues to move beyond horrors like slavery and keep inventing amazing things. I listen regularly to the wisdom of Abraham-Hicks, a source of wisdom from our Higher Selves, Spirit, the Other Side, whatever one cares to call it. I always come away from a listening session feeling more loved. One of the things that has stuck with me long-term is Abraham's emphatic statement: "No one came here to be the keeper of you, and you did not come here to be the keeper of anyone else." It's a somewhat polite way of saying, "Mind your own business." Because we have free will (the fundamental basis of existence on this planet), and because we came here to expand our consciousness in myriad ways, we are most definitely creatures of self-interest. Few folks want to flat-out own that. God forbid we should be called "selfish." But according to Abraham, all that matters is that we feel good, thereby keeping our energetic vibration high, which attracts good to us (think the Beach Boys song, "Good Vibrations"). Folks who label someone as "selfish" are simply indicating that the labeled person is not behaving in a way that makes the labeler feel good. Look at your own life--your actions are done because they make you feel good in some way (even do-gooder acts) or you don't continue doing them. It's when we are asking someone else to be or behave differently so that we can feel better that we give up our personal power. It is impossible to change others or circumstances. Our only empowered choice is to work within ourselves to feel good, no matter what is swirling around us. Human behavior has been and always will be based on self-interest. May we be most interested in feeling good, being intimately in touch with our divine nature, aligned with Spirit. If this were the case with each one of us on the planet, there would be no wars, violence, sickness, etc. I'd say that makes self-interest look pretty damn good. Tonight we give thanks for the great gift of friendship and in particular for my dear friend, _______________. Thank you for the circumstances that brought us together and have bound us into the sacred bundle of life. Thank you also for the gifts of our friendship: for knowledge that comforts, for words that encourage, for insight that blesses, for all the experiences shared, for the sweet bliss of deeply knowing each other in so many ways; for history and a hope of the future, for conversation and laughter, for silence, for bearing each other's witness truly, for holding each other safe in our hearts with great love and tenderness. --by Daphne Rose Kingma, in "A Grateful Heart"
Make a list of all the possibilities for filling in that blank, and don't forget family members. My list includes "D, D, E, A, C, B, M, J, A, S, D, K, C, L" and many more. It's a good day to be grateful for the love in our lives!